The Happy Homebodies: Closet Makeover: Finished! This project was a lot more work than I expected, but I am so so SO happy with how it came out. The new closet feels much bigger and brighter and ties in well with our master bedroom, unlike the cedar beast we had before. I was going for a "glamourous shabby chic" look, and I think that's what we ended up with! * Whitewash every inch of the space... walls, ceiling, cabinets, drawers. UGH! My arm was so tired, and my back was killing me! * Paint the beige mirror glossy black for some "glam"
* Make a chandelier and install it around the existing recessed lighting. You'll be happy to know that I came in at $35 and saved a bunch of money by making my own. I can't wait to share my method with you in my next post! * Add crystal knobs to the drawers. There were no knobs before, and they were a pain to open. 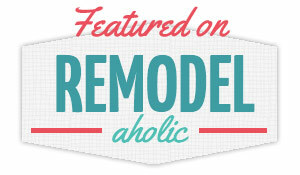 * Tear out the ratty old carpet and continue the flooring we used in the master bedroom. I had fun arranging it like a little boutique with some of my favorite white wardrobe items. If only I could keep it that sparse– ya right! That white beaded top was passed on to me by my late grandmother, and I wore it for our engagement party. The white dress with the bow sash was my exit outfit at the wedding, and the white eyelet dress was the rehearsal dinner outfit. I guess I chose those items to display because A) they are white, B) I love them, and C) they bring back wonderful memories. The master bedroom is full of my clothes and shoes that I took out of the closet to work on the project, and I'm going to do some reorganizing (and donating) before I throw it all back in there. I'll be back with pictures to show you how it looks once it is totally functional. Also, I want to find a little rug for that space. Any ideas? Do you think a small rectangular rug or a runner would be best? I like this one from Crate & Barrel and this one from Ikea, but I'm open to other ideas!